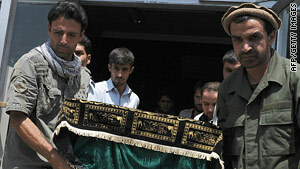 Relatives and friends carry the coffin one of the slain Afghans from a morgue Monday in Kabul, Afghanistan. (CNN) -- The International Assistance Mission on Monday identified the 10 aid workers killed by gunmen in Badakhshan, Afghanistan, last week. The 10 "were our friends and colleagues from the Nuristan medical eye camp team," the organization said in a statement. Ali worked as a watchman at the National Organisation for Ophthalmic Rehabilitation's (NOOR) maintenance workshop, a position he had held since 2007, the mission said. "He stayed behind guarding the vehicles in Nawa when the rest of the team walked over the pass into Nuristan." He is survived by his wife and three young children. Cheryl Beckett had been working in Afghanistan since 2005 with a focus on nutritional gardening and mother-child health. As a student at Indiana Wesleyan University, Beckett, a minister's daughter, developed a global passion for justice and love during her travels to Honduras, Mexico, Kenya and Zimbabwe, according to her obituary. The IAM said she was a Pashto speaker who had been asked to assist the medical team in translating for women patients. 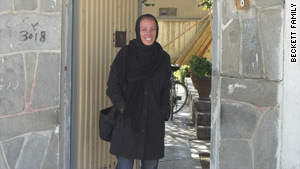 She had been working in Afghanistan since 2005 with a focus on nutritional gardening and mother-child health. She worked in a clinic in Pul-e Charkhi on the outskirts of Kabul. She is survived by her parents and three siblings. "Cheryl loved and respected the Afghan people. She denied herself many freedoms in order to abide by Afghan law and custom," said a statement from her family released by the Woodlawn Christian Church in Knoxville, Tennessee, where Beckett's father is pastor, according to CNN affiliate WVLT. "She was honored to be included in this most recent three-week medical journey to the remote populations of Northern Afghanistan. ...Those who committed this act of terror should feel the utter shame and disgust that humanity feels for them." Beyer was a linguist and translator in German, English and Russian who also spoke Dari and was learning Pashto, the IAM said. She worked for the organization between 2007 and 2009 doing linguistic research and joined the eye camp so she could translate for women patients. She is survived by her parents and three siblings. Carderelli was a professional freelance videographer who worked with a number of Afghan development and humanitarian organizations throughout the nation, the IAM said. "Brian quickly fell in love with the Afghan people and culture and hoped to stay within the country for another year." Jawed was a cook at the Ministry of Public Health's Eye Hospital in Kabul, and had been released in order to attend the Eye Camp as the team's cook. He also assisted with dispensing eyeglasses, the IAM said. He is survived by his wife and three young children. "Jawed had been on several eye camps into Nuristan in the past, and was well loved for his sense of humor," the organization said. Grams was a dentist and a friend of team leader Tom Little, the IAM said. He had been working with Global Dental Relief for 10 years, and had been to Afghanistan several times, as well as in Nepal, said Katy Shaw, an administrator with the group. 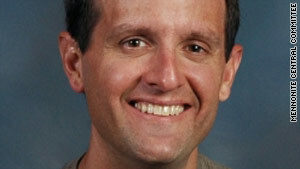 He was a general dentist who gave up his private practice to do relief work, Shaw said. Grams started as a volunteer with the group, which provides dental care for impoverished children, but later became a team leader. Glen D. Lapp, 40, of Lancaster, Pennsylvania, worked for a charity that provides eye care and medical help. On Sunday morning, Lapp's family received confirmation of his death from the U.S. Embassy, said the Mennonite Central Committee. Lapp worked for the International Assistance Mission, the Mennonite Central Committee's partner organization, which provides eye care and medical help in Afghanistan. Lapp was trained as an intensive-care nurse and had worked in Lancaster, New York, and Supai, Arizona, the IAM said. He also was a response worker after hurricanes Katrina and Rita struck the Gulf Coast. He came to Kabul in 2008, and worked at the IAM headquarters. After five months of Dari language training, Lapp began working with the National Organisation for Ophthalmic Rehabilitation. He was responsible for organizing mobile eye camps in the remote areas of Afghanistan. 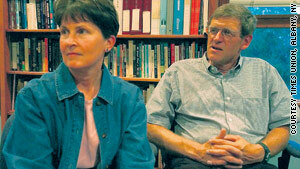 Tom Little, here with his wife Libby, had recently become involved in a program to eradicate preventable blindness. Little, the team leader, was an optometrist who was affectionately known as "Mister Tom" among staff at the National Organization for Ophthalmic Rehabilitation, the IAM said. He arrived in Afghanistan in 1976 with his family and worked as NOOR's optometrist and manager, setting up clinics and workshops. "He was much loved by both foreigners and Afghans, and was the inspiration for other IAM team members coming to Afghanistan," the IAM said. He is survived by his wife, Libby, and three daughters. Little's wife, Libby, confirmed the death. She said she knew the worst had happened when she didn't hear from her husband after 24 hours. She described a system they established years ago -- he would give her a short, 30-second call every 12 hours to let her know he was okay. When two cycles went by without a call from her husband, she said she knew something was wrong. Little had recently become involved in a program to eradicate preventable blindness by the year 2020, his wife said. "He would come back to the States and get throw-away optical equipment, then refurbished it, then would send it over to set up a little optical manufacturing factory, so they could make their own eyeglasses there," Libby Little said about her husband. Terry came to Afghanistan in 1971, the IAM said, and "had a heart for the rural areas of Afghanistan." He worked for many years in the Lal-wa Sarjangal district of the country. "Dan specialized in relating to local communities and liaising with aid organizations and the government to improve services in remote areas," IAM said. He is survived by his wife, three daughters and one granddaughter. The British Foreign Office confirmed Woo's death Sunday. The IAM said she was a general surgeon who joined the Nuristan Eye Camp to be the team's doctor and to help promote maternal health care in Nuristan communities. Rahimi said he spoke with Woo three weeks ago, while she was packing for a trip with the assistance mission to Nuristan province. He told CNN that Woo had medicine and medical equipment procured after a period of fundraising. Woo was excited about the trip but was fully aware of the risks she faced making this kind of journey, he said.